Experiencing another culture is among the best parts of vacationing. Experiencing that culture from behind the wheel? Not always. Case in point: the scenic countryside in Pembrokeshire, Wales. Napolean standardized traffic in continental Europe, decreeing that all would move on the right. Popular belief holds that the British chose the left to spite the French. Spiteful or not, it makes each drive in Wales (yes, Wales is a part of Britain) a mini-adventure. Everything’s flipped, from the steering wheel to the gears to the way the windows roll and, of course, the roads. Furthermore the signs are bilingual, English and Welsh – a consonant-heavy maze Tolkein wouldn’t have forced on orcs. The effect is charming, unless you’re trying to get somewhere. Pembrokeshire is gorgeous, featuring hundreds of shades of green countryside and hundreds more shades of pink in the locals’ faces. But, beautiful as Pembrokeshire is, ‘road’ exaggerates what you’re driving on. Most roads are barely wider than a king-size bed except for passing spaces – paved wedges grudgingly extended into the farmers’ fields every few hundred yards – where the less aggressive driver halts until the other zips past, maybe acknowledging you with a slight nod. Driving here produces an emotional first: quaintness with terror. Imagine dropping a plate of spaghetti on your front steps. Congratulations: You’ve just engineered the Pembrokeshire road system! Bring a map and PhD in geography. It’s hilly, curvy and baffling. A sudden bend around a bump and you’re often face-to-face with another driver on a 14-degree incline. You may need to reverse, curving uphill to find a passing wedge. 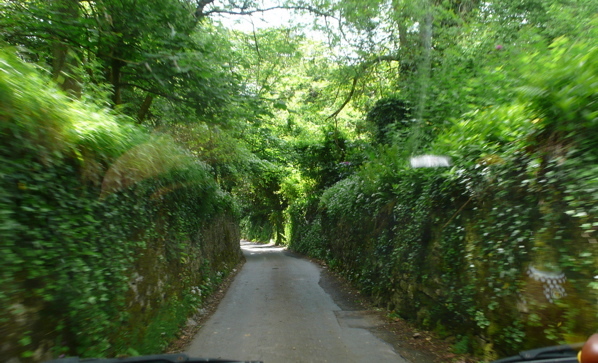 Furthermore, roads are often flanked by 20-foot hedgerows. You feel like Luke Skywalker surfing through the channels of the Deathstar without the benefit of the Force. Not that any of that slows the local drivers. If you ever make it as high as 4th gear, you’re either suicidal or local. Next in the series: You thought running with bulls in Pamplona takes guts? Try driving Barcelona.